Comfortable clothes plus shoes required. Carry an extra pair of clothes. Hire a taxi from Alibag town. How popular is Alibag Beach? People normally club together Nagaon Beach and Akshi Beach while planning their visit to Alibag Beach. 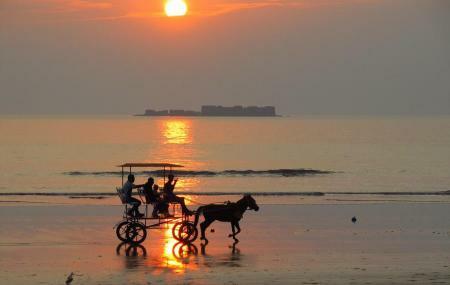 People also prefer to start their day with Alibag Beach. The water in the sea is too much contaminated to get into. Try not to get into water. There are many beach side activities available like gliding, bike ride etc to enjoy. A good weekend spot away from the city. It’s a quiet good black sand beach. However, it is not as beautiful as Puducherry or Andaman & Nicobar islands. But I enjoyed here & I hope you’ll will also have fun.